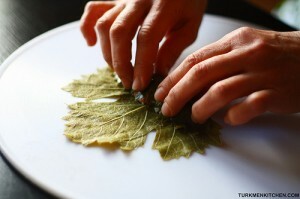 Soak the grape leaves in boiling water for 5-10 minutes. Then rinse several times if you are using canned grape leaves (to remove excess salt). Drain and remove the stems. In a bowl, combine the finely chopped dill, parsley, onion and garlic. Add the lemon juice, rice, meat, tomato paste, salt, black and red pepper, and mix everything together. Take one leaf and spread it out on a flat surface, shiny side down / vein side up. Place a tablespoon of the filling (depending on the size of the leaf) in the middle of the leaf. Fold the stem end over the filling, then fold the left and right sides into the middle, and roll towards the tip. Line the bottom of a large pot with the leftover or torn leaves (to prevent the stuffed leaves from sticking to the bottom) and pack the stuffed leaves in tight layers. Add a pinch of salt and enough water to just cover the stuffed leaves. 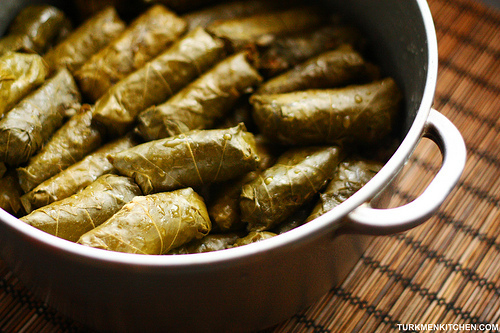 Place a plate on top of the stuffed leaves (so that they don’t float around and unravel) and cover the pot. Bring to a boil over high heat, then reduce the heat to medium and cook for 45-50 minutes, or until the water is absorbed. Serve with yogurt. awwwwww this one with rice is veryyyyyyyyyyyyy goooooooood.!!! cold yogurt on it and that just something special!!!! Maral, I agree with you, it will be really so good if one can afford it. Hi! I am Bulgarian and I remember my grandma used to make these very often! Do you put uncooked rice in the stuffing? I remember that my grandma cooked it half-way through… But I want to try your recipe, just wanted to make sure it’s uncooked rice. Thanks a lot! you have amazing recipes! Thanks Larisa! Yes, the rice is uncooked. Yes balkans and greeks have learned this from turks, now all of you trying to steal and claim. what do you think about this general behaviour of yours ?